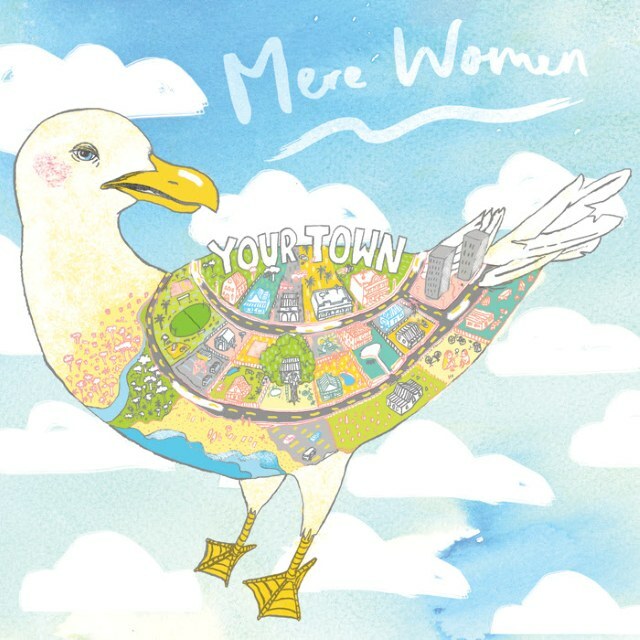 Your Town is one of the most accurate and on point records lyrically this year. For me personally it drives the nail home and reminds me that time is limited, that things end and not always well. It’s a fearful record at times, but strong in facing and addressing those fears. It battles cognitive dissonance with audible dissonance in spectacular fashion. It’s a cry to the void, but one that doesn’t expect a call back. Straight up, real talk: Mere Women have created something amazing with Your Town. I’m in love with this record – it’s beautiful; reflective and painful, but honest. Mere Women have pulled no punches and have poured what seems like years of emotionality into their songs – opening up and becoming vulnerable for our listening pleasure. It’s an impressive selection of moving and powerful rock that fluctuates from noise to punk and back again. The musicianship is top notch; everything is on point and recorded beautifully. One of the major constants in the guitar work – some of the most impressive riffs I have heard this year. They’re jagged, taught and relentless (at times I was reminded of At The Drive-In, but more full) – also seemingly effortless on the frets. The sound is one saturated in reverb, yet crisp – thanks to some quality recording. For me, what makes this album so incredible to be is the vocal work and lyricism of Amy Wilson. Your Town is a stand out to me thanks to the vocals alone, yet thankfully they are backed ably by amazing sound. The vocals can move from tremulous and powerful in the space of a verse. They are distraught, pining – caught up in some inner turmoil. Amy Wilson dissects the uncertainties of life and the insecurities of the mind. She chants, she repeats mantras and thoughts – stretching them for maximum effect. Her words are relatable mostly to those who lay within the 22 to 28 year age bracket, where important questions have to be asked of yourself and answered. It can be a frightening and at times directionless part of your life (trust me, I’m going through it myself) and this is addressed throughout Your Town, touching on different aspects of young adulthood. The vocals address some heavy issues and they aren’t reassuring either. It’s a confronting examination of the constant losses in life, unavoidable and difficult to deal with, even when you see them coming. While at times pessimistic, there is braveness and strength in the vox, even though the topics addressed in the lyrics are overwhelming and undermining mentally. Where did the time go? Where did the time go? While the thought goes through my mind all the time, it’s nice to hear someone else vocalise it – it eases my mind. I hope making this record eased the minds of Mere Women too.